Since 1977 we have been perfecting our skills in every aspect of piano technology and all related services. Our depth enables us to offer the beginner, recreational and professional pianist, music teacher, conservatory, university and concert hall the finest pianos and services in the industry. We invite you to explore our site. Please Contact Us or call us at 902-455-0880 or 1-877-423-3222. 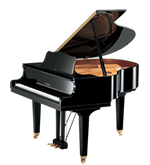 Best of all, visit our showroom to see, hear and play all our beautiful pianos. We would love to meet you. We welcome evening and Sunday appointments. We know pianos inside out.